Mikeosbornphoto has just clocked up its 10,000th view, which seems a good moment to stand back and reflect on six months of sharing photography and thoughts. Making contact with many great fellow photographers and bloggers has been a rewarding experience, including ckponderings, Diana J Hale, Stevie Gill, Noeline Smith and Danita Cahill – regular and much appreciated visitors and comment makers. When I created this site, we had just enjoyed an unusual spurt of warm, sunny weather in parts of the UK, and the first photograph I posted – called Basking Brighton – seemed to hold hope for a barbecue summer. Well, the season was blighted by wet weather but was saved by a feast of sport and Olympic fever. And that all seems a distant memory now, and today there is a chill in the air and a sodden depression swirling over us. Thanks for the kind words and I look forward to the next six months and more. Love the header image! You’re welcome, Diana. I truly appreciate the regular and familiar contributors. Yes, I’m going to stick with the header! Excellent, Mike! And thanks for the mention. Thanks Danita and you’re most welcome. I appreciate your input very much. Thanks very much! And it’s mean a lot that you visit and comment regularly – the most regularly, in fact! I’m glad to hear that – I’m a great believer in the reader too and the photographs have to stand out. Stalkers are good! You’re welcome Noeline, it’s always good to have your feedback. It’s not about the number, but how much you enjoy doing this. Thank you very much! It would be nice to know your identity! Thanks Alexander. And I really appreciate your support and friendship through the joy of photography. Thank you very much. And don’t stop photographing the streets of Belgrade! Get your old Zenit back from you ma’s and shoot some black and white film in the winter.You won’t regret doing it, i promise. It took me a while to work out who knew such information! Indeed, dear chap, a good idea. Lord knows what happened to that gorgeously solid camera, mind. Congrats on 10,000! Will be my turn next, I’m about 400 views shy of 10k. 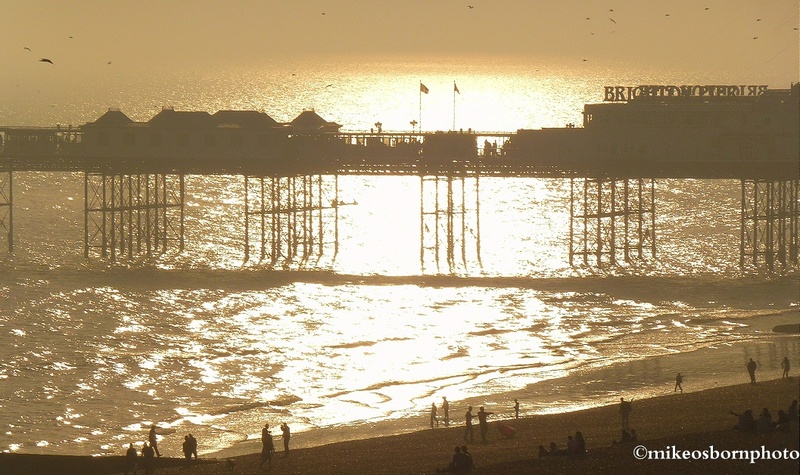 And a shot of my town too – most of my first digital shots we’re of the Brighton piers. Excellent :-) I’ll look out for your milestone. As well you know, Brighton is always a great place for photographs.